Ivan James, under jockey Raul Ramirez Jr., sets the top qualifying time to the Grade 2 Sam Houston Futurity at Sam Houston Race Park. HOUSTON, TX�APRIL 4, 2015�Sam Houston hosted 19 trials today in preparation for the richest race of the 2015 Quarter Horse Meeting, the Sam Houston Futurity (G2). The tenth trial of the afternoon produced the fastest qualifier when Ivan James crossed the wire of his 330 yard trial in 16.748 under rider Raul Ramirez, Jr. The son of IVORY JAMES out of the Dashin Bye mare First Dashin Bye is bred and owned by Jorge Meraz of Bastrop, Texas. Trainer Angel Sanchez had a sensational night, winning six trials and qualifying three for the final. Raul Ramirez, Jr., who tied with David Alvarez for the leading riding title at the recently concluded Louisiana Downs Quarter Horse meet, had high praise for Ivan James. Meraz owned First Dashin Bye, who won 9 of her 12 starts, completing her racing career in style in 2008 with a five-race win streak, ending with a victory in the $165,800 Delta Downs Derby. The ten finalists will return on Saturday, April 25 to compete for a purse in excess of $600,000. 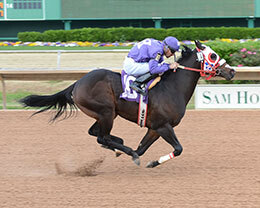 One will join a noted list of the Sam Houston Futurity, which includes two previous AQHA Champion 2-year-olds: Kiss My Hocks (2014) and Azoom (2004). Other graded stakes winners include Snowy Alibi, Sassmaster and Jess Tee Off. To view the complete list of the ten fastest qualifiers with times, sires, dams, owners, breeders, trainers and jockeys CLICK HERE.